Now the many fans of Tatiana de Rosnay’s novel, Sarah’s Key, will be clamouring to see the movie version, starring Kristen Scott Thomas as Julia and Melusine Mayance as Sarah, in theaters across the nation — I will be one of them! Over a year ago I read this riveting and haunting Holocaust tale and I knew I must share it with my book club. Since that time Sarah’s Key has been read by countless book clubs! For those who might not be familiar with the book, de Rosnay, intertwines two stories. Sarah’s story takes place in 1942 in Paris during the Vel’ d’Hiv’ Roundup as Sarah and her family suffer the astrocities of the roundup and the deportation to Auschwicz at the hands of the Nazi. The roundup of the Jews took place on the orders from the German military and were carried out by the French government. The other part of the book takes place in 2002 as Julia Jarmond, an American journalist living in Paris deals with her own personal crisis. While in Paris, Julia discovers a mystery that she feels she must uncover. Over the course of time the past and the present come together. Julia learns of a horrific discovery which involves her husband’s family and leads to the eventual connection to Sarah. If your book club has yet to read and discuss Sarah’s Key by Tatiana de Rosnay, now is the perfect time to do so. Here’s the link to discussion questions for Sarah’s Key. Join the magnitude of book clubs who have already discovered and embraced this mesmerizing tale. 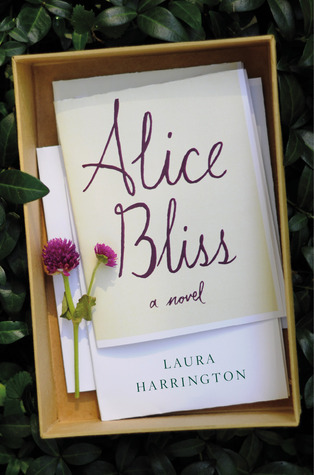 Letters to live by written for Alice by her father are just part of what makes this coming of age story, Alice Bliss, by Laura Harrington, so unique and special. For fourteen year old Alice she chronicles how she deals with life in the absence of her father while he goes to Iraq. Matt Bliss has joined the National Guard because he feels it’s his duty to contribute to the war. He joins knowing there is the possibility of being called to duty to serve his country. The day arrives when it becomes a reality. Life goes on in the Bliss household as Alice, Ellie, & their mother deal with missing Matt in their own respective ways. The bond between Alice and her father is a special one as any daughter knows. Alice cherishes the days when a letter arrives for her from her father – or the far and infrequent phone calls just to hear her father’s voice. One of Alice’s favorite pastimes was the joy she experienced as she and her enjoyed gardening together. This relationship resonated with me on a very personal level –BUT I can’t divulge why unless I give away the outcome and ending to the story. What I can say is I felt as though I was reliving a part of my youth as I read about Alice and her feelings with the absence of her father. She’s at a time in her life when she will be experiencing the “firsts” such as a dance, a possible boyfriend, and joining the track team, in her young teenage years and she wants and needs her dad to be a part of it all. I enjoyed reading about Alice’s blooming relationship with her best friend, Henry. Ellie, Alice’s younger sister, deals with the absence of her father by reaching for a particular book from her father’s favorite bookshelf –his leather bound college dictionary. This is her way of feeling close to her father just as Alice has latched on to her father’s worn shirt she discovers in the hamper, with his lingering scent. His dictionary and his shirt are Ellie’s and Alice’s physical connection to their father. Alice and her mother have somewhat of a strained relationship as they both are trying to cope. Alice doesn’t realize what her mother is going through while Matt is gone. As a husband and wife share family responsibilities, Angie now discovers she must be in charge of everything, which can be an undertaking. Angie is lost without him and finds herself working more hours to combat her loneliness. Alice in turn has to help her mother with some of the daily household chores. Each of them are dealing with their own inner turmoil but not letting the other one in to help them to cope. This is a time when they should be reaching out to each other for help. I stated above I found a personal attachment to the character of Alice. The tears shed by Alice’s separation with her father were also reminders of the tears I shed as a young fourteen year old myself with my own somewhat similar father/daughter experience – yet different. Laura Harrington hits on a very timely issue for families everywhere who have parents serving our country. I would highly recommend this to be shared with families to help generate discussion. The characters are quite identifiable to the reader as is the essence of the story which will ring true for so many. Purchase your copy today at Amazon! You will fall in love with Alice and and her heartwrenching story!